Page title: Who Killed Canada’s Education Advantage? Who Killed Canada’s Education Advantage? On October 14, 1992, at the Lower Manhattan offices of Standard & Poor’s, a sovereign debt analyst put the final touches on the company’s decision to downgrade Canada’s foreign currency debt rating from aaa to aa+. S&P’s ratings, like those of its chief competitor, Moody’s, reflect the relative risk that a long-term financial obligation (such as a corporate or government bond) will not be honoured. The higher the rating, the lower the risk. To the world at large, the difference between ratings is somewhat obscure, but a small variation can have a tremendous influence on the financial markets. If S&P or Moody’s declares your bonds to be below investment grade, then by law many pension funds and other large institutional investors are forbidden to hold them. And any decline in rating affects the interest rates for those bonds, and thus their attractiveness to investors. S&P, which was responsible for assessing the relative risk of sovereign debt—that is, debt backed by a government treasury—noted that the downgrade reflected “the progressive deterioration in Canada’s current account deficit in recent years, a consequent sharp increase in its already sizable external debt burden, and the prospect of only a moderate improvement in the balance of payments in the medium term.” Simply put, Canada had burgeoning federal and provincial budget deficits, and a growing mountain of debt, and it showed no signs of improvement on these fronts. Sitting cozily in a New York skyscraper, S&P’s analysts could not have known the ripple effect the new rating would have. For Canada, it was the proverbial butterfly flapping its wings in the Amazon and causing a tornado in Texas. It started a wave that spilled through an influential think tank, to Canada’s federal government, to the provinces, most notably Ontario. Among its most significant and yet least appreciated consequences was an unprecedented disinvestment in public education, which destroyed a historical competitive advantage in the space of a decade. We now find ourselves dangerously unprepared to prosper in the modern economy. And if we’re going to fix the problem, it will help to understand how we created it. In 1992, education wasn’t on many Canadians’ radar screens. Our national attention was focused on debt and deficits. Things were getting desperate. Under Pierre Trudeau’s leadership, the federal deficit had ballooned from $1 billion in 1971 to $33 billion in 1984. Despite the concern expressed by Brian Mulroney’s Progressive Conservative government, and new debt-fighting measures like the profoundly unpopular goods and services tax, annual budget deficits remained standard practice. By 1992–93, the deficit had tipped over the $40-billion mark. When S&P downgraded Canada’s rating, the federal and provincial governments owed $665 billion between them, about $300 billion of which was foreign debt. The total amounted to over 96 percent of the country’s gross domestic product. It was a bad time to be in poor fiscal shape. By 1991, the world economy had fallen into a sharp recession. The downturn was particularly difficult for Canada. gdp fell by 3.1 percent in a single year. Unemployment spiked from 7.5 percent in 1989 to 11.2 in 1992. Recovery was proving to be slow and painful. And now alarm bells were ringing about our deficit. As one of the most stable and prosperous democracies on the face of the planet, Canada had long enjoyed a pristine triple-A bond rating, giving it access to the cheapest foreign debt in the world. While the S&P downgrade was minor, it still sent a shudder through Canadian economists. The first ripple washed over the C.D. Howe Institute, one of Canada’s pre-eminent economic policy think tanks. Honouring the Canadian tradition of paying more attention to folks outside the country than within it, the institute published a major report in February 1993, substantially spurred by the S&P downgrade. Normally, a report on Canadian fiscal policy from a group of economists might be expected to attract little mainstream notice, but this one was different, in both tone and impact. Avoiding a Crisis captured the attention of the media and the public, and provided an impetus for the transformation of Canada’s fiscal policy, helping make “deficit” a dirty word. “Huge deficits and rapidly growing debts,” the authors warned, “have brought the country to the threshold of a fiscal crisis.” They suggested that among the effects of unconstrained deficit spending was the very real possibility that foreign lenders might soon decide Canada was no longer creditworthy. The furor over the Howe report was ultimately knocked off the front pages by even bigger news: the resignation of Prime Minister Brian Mulroney. His departure, and the subsequent sweeping electoral rebuke to the federal Progressive Conservatives, set the stage for further ripple effects, particularly the emergence of new ideologues on the left and right, all of whom would use the downgrade and the Howe report as a platform upon which to make their reputations. Enter Jean Chrétien, the little guy from Shawinigan, and his no-nonsense economic fixer, Finance Minister Paul Martin. And at the provincial level emerged such populists as Ralph Klein, already in office as Alberta’s premier; and Mike Harris, soon to be Ontario’s premier. Martin and Harris proved to be the key actors, however unwittingly, in the decline of Canada’s education infrastructure. The ripple effect that began at S&P hit the federal government first. Martin was an ex-businessman with unimpeachable bona fides; his father had served as a cabinet minister under four Liberal prime ministers, and Martin himself had worked as an aide to politico Maurice Strong when they were both at Power Corp., before making his personal fortune at Canada Steamship Lines. First elected to Parliament in 1988, he moved from the Opposition benches to the plum Finance post after the October 1993 election. Institute for Competitiveness and Prosperity analysis based on data from Statistics Canada, Consolidated Government Revenue and Expenditures (CANSIM Table 385-0001); US Census Bureau, State and Local Government Finances; Office of Management and Budget, Historical Tables; National Academy of Social Insurance, Workers’ CompensationL Benefits, Coverage, and Costs, multiple years, Workers’ Compensation Brief April 2008. US Health spending includes workers’ compensation and benefit outlays, and excludes administrative and other costs; Canadian health spending includes all workers’ compensation. Values adjusted using appropriate deflators. US dollars converted to Canadian at 2007 purchasing power parity. Martin’s reputation as finance minister bears no resemblance to the Mr. Dithers persona later pinned on him as prime minister. He was known as a determined, decisive politician, disinclined to entertain views from bureaucrats who questioned his approach. Polished, thoughtful, and urbane, he gave the public the sense that he was both well connected and well read—a little wonkish, perhaps, but with ideas backed up by his success in the private sector. Behind closed doors, he could be nakedly ambitious, combative, and utterly unyielding. He was an internationalist from the start, and cared deeply about Canada’s standing on the world stage. So foreign investors mattered to him a great deal. It is no surprise, then, that he took full advantage of the opportunity afforded him by S&P and the C. D. Howe Institute to make his name as the man who slew the deficit. Over the two fiscal years between 1995–96 and 1997–98, Martin achieved an impressive $33-billion turnaround in Ottawa’s fiscal position, moving from a $30-billion deficit to a $3-billion surplus. The economy had helped him by providing $21 billion of that figure in increased revenues, but he also cut $12 billion worth of federal spending. By 1997–98, he’d managed to deliver the surplus, a task thought five years earlier to be impossible. He became an international hero for his efforts and was soon, much to his boss’s chagrin, the presumptive next prime minister. But where did Martin find that $12 billion in cuts? 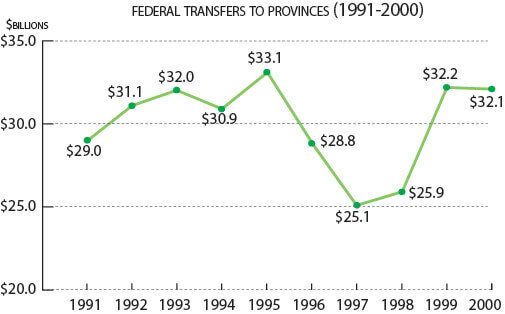 The biggest rollback was in transfers to the provinces, money used to fund education and health care, the two biggest provincial expenditures. Martin chopped almost $8 billion, or 24 percent, from this budget line between 1995–96 and 1997–98, a time when the provinces were all dealing with their own fiscal challenges. 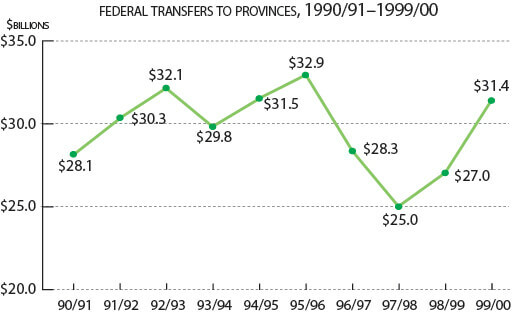 Ironically, by 1999–2000 provincial transfers were nearly back to the level they were at in 1995–96. But by then the provinces had already changed their approaches to spending. So it was in Ontario. Hard hit by the recession, the province was experiencing an extraordinary political shift. Having flirted with the left by electing its first ndp premier, Bob Rae, the province was about to swing hard to the right. Throughout the early 1990s, the province struggled as Rae fought to contain costs and labour unrest as well as manage a dreadful budget situation. The recession was not of his making, but neither did he turn it around. Ontarians didn’t give him a second term to get it right, turning instead to Mike Harris and his Common Sense Revolution. While Martin was born into the Liberal elite, Harris’s path to power was considerably less preordained. A university dropout, former elementary school teacher, and, yes, golf pro from North Bay, he was elected to the legislature in 1981, where he served as a backbencher in Bill Davis’s government and, briefly, as minister of natural resources and energy under Frank Miller. He cultivated an outsider’s stance, positioning himself as a regular guy from small-town Ontario more in step with ordinary people than with Toronto’s upper crust. For all that cultivated folksiness, he was genial, bright, confident, handsome, and well spoken. He became party leader in 1990, shifting the Conservatives away from the Red Tory centre and further toward the right. By 1994, with an election approaching, he was poised to shift it still more. After Harris’s election, education became one of his many battlefields with social activists, and it proved an especially important one. Critics often pointed to the fact that he named a high school dropout as his first minister of education. Others cited Dalton Camp, who argued that Harris had a “paranoid fear of education.” A particular focus of controversy was Bill 160, the Education Quality Improvement Act, which changed funding structures and forced teachers to work more and with fewer resources—the loudest volley in a program that also included school closures, board amalgamations, and the introduction of standardized testing. Large-scale protests and strikes followed the bill’s introduction, and the hard feelings linger to this day. The shadow cast by Bill 160 over primary and secondary education in Ontario is such that it obscures the dramatic effect Harris’s policies had on post-secondary education. At the time Harris became premier, Ontario had still not recovered from the deep deficits created during the recession. Having pledged to leave health care alone, he turned instead to education, which was already suffering from a per capita spending decrease during Rae’s tenure. In Harris’s first two years, education expenditures dipped $1 billion, or 5 percent. The centrepiece of this program was a 14.3 percent cut in funding for Ontario universities. Harris’s cuts were grounded in a belief that the education system was profligate. So even when the economy finally recovered from the recession and he could dramatically ramp up per capita health care spending, he kept education spending flat, and left it that way for his final five years as premier. Consequently, Ontario postsecondary funding, for example, fell by 21 percent during the ’90s while enrolment increased by 8 percent. Contrast Canada’s response to the 1990–93 economic downturn with that of the United States, which admittedly entered the recession in better fiscal shape than Canada: total deficits in the US across all levels of government represented 4.2 percent of gdp in 1990, before the recession struck. That figure grew as high as 5.8 during the recession, but by 1995 it was back down to 3.1 percent. By comparison, in 1990 Canada had federal and provincial deficits comprising 5.8 percent of gdp, and by 1992 that figure had reached 9 percent. While activists warned about American debt levels, the US did not engage in the dramatic deficit fighting seen in Canada. State systems such as education therefore did not experience the kind of shock Canadian provinces did. US governments flatlined real per capita education spending only briefly—from 1992 to 1994—and let health care spending rise modestly over the same period. As soon as the economy recovered, education spending increased every year from 1996 onward, as did health care spending. In Canada, the post-recession story was dramatically different. Real per capita education spending fell each year from 1993 through 1997; the drops were so steep and the reinvestment so modest that spending in 2003 was actually lower than it had been a decade before. Health care spending, on the other hand, decreased modestly between 1993 and 1997, then shot up every year at a pace equivalent to that of the US. Essentially, we took ourselves from a position of strength to one of weakness. Few Canadians are aware that until 1995, this country enjoyed the world’s highest level of per capita public investment in education, higher even than the amount spent by our much richer neighbours to the south (though, to be fair, Americans make a much higher private investment in education than we do, so their total investment is higher). Contrary to popular belief, Canada is not rich primarily because of its resource base or its health care system. Many countries have natural resources, and quite a few have health coverage that rivals Canada’s, but until 1995 no one kept up with us on education investment. Our beloved health care system lost its lead in public spending in 1995, but regained approximate parity with the US in 2000 and has maintained it ever since. In contrast, by 2002 Canadian education spending had fallen a full 17.5 percent behind that of the United States. In Ontario, Mike Harris turned the 4 percent advantage in per capita spending he inherited into a 25 percent disadvantage by the time he resigned in 2002. The blame for the disregard we’ve shown for education over the past decade and a half doesn’t lie merely with financial pressures. The Canadian political system has a deep bias toward consumption. Broadly speaking, public expenditures can be broken into two fundamental buckets: investment in building future prosperity, and consumption of current prosperity. When the government funds scientific research or doubles the capacity of the Windsor–Detroit border crossing, it is making a long-term investment in future prosperity. That double-width tunnel or bridge costs billions now and offers little immediate benefit—its value is spread out over the next fifty years. The same holds for scientific research. Rarely does the money invested benefit its funders in the first year. But its long-term upside is gigantic. For any advanced economy, the biggest investment in future prosperity is education. Putting a student in a classroom has zero current economic benefit. In fact, for late-secondary and post-secondary students, education is a big negative. It keeps potential workers out of the workforce and sticks them in a classroom, where they must be supplied with an infrastructure, educators, and so on. What could be a worse short-term deal? But education is the best investment in future prosperity in the world. To appreciate this, consider wages, which serve as a proxy for productivity (because an organization can’t stay in business if it pays a worker more than the value he or she produces). In Canada, the average salary for someone with a post-secondary degree is $58,767 a year—50 percent greater than that of the average high school graduate, and 69 percent greater than that of a high school dropout. In educating themselves, citizens therefore become much, much more productive, which pays tremendous dividends to society in the long run. The consumption of current prosperity, by contrast, provides a large benefit today but does little to enhance our fortunes in the future. Helping the disadvantaged among us to afford shelter and sustenance is a good example. We can fund welfare for poor families and special buses for disabled workers because we are sufficiently prosperous today. Such expenditures are the mark of a good and caring society. The largest consumption of current prosperity by governments around the world is health care. In Canada, because we are wealthy, we can provide this service at a high level, which improves our quality of life. Of course, not all health care is consumption—there is obvious future benefit in getting an injured worker back on the job, or fixing a baby’s heart so she can become a productive member of society. However, the bulk of health care costs, including the increasing proportion spent on elderly Canadians in their retirement, represents pure consumption. History shows that we can’t trust our politicians to be forthright about the balance they will strike between consumption and investment. The electorate is easily swayed by those who offer more in the here and now, so politicians have a strong incentive to emphasize spending over investment. The Ontario electorate loved being told the Common Sense Revolution would not touch a penny of health care spending. No politician of any stripe told Canadians that, as of 1993, we were going to make a historic shift away from investing in future prosperity to intensify consumption of current prosperity, but that’s precisely what our leaders did. It must fall to the electorate to push for better balance, because elected governments have huge incentives to favour consumption of current prosperity. It would take an increased annual education expenditure of over $21 billion across all levels of government in Canada to return to the per capita spending position we enjoyed relative to the US in 1995. Ontario, because it has allowed its spending gap with the States to grow even wider, would require $10 billion, consuming nearly half of the $21 billion even though only 39 percent of the Canadian population lives there. One of the few bright spots in recent years was the McGuinty government’s decision to reinvest in post-secondary education. Its 2006 budget increased funding by $1.24 billion a year for five years—not nearly enough, but at least a bold and welcome start. The great irony of the events triggered by the flap of the butterfly’s wings at Standard & Poor’s in Manhattan is that Canada shifted dramatically away from a historical competitive advantage in education just as the world was finally entering the long-promised knowledge economy. There had been talk about such a shift for years, if not decades, but by 1995 it was utterly clear that the twenty-first century would be driven by knowledge, and by the education systems that fuel it. Right at that pivotal moment, Canada bailed. We decided as a country that we would instead kick back and consume. It’s not too late to repair the damage, but it will soon be. Thank you to James Milway and Jennifer Riel for their assistance in researching this essay. Amedeo De Palma is a senior graphic designer at CBC.